After hundreds of issues of The Vermont Cynic disappeared from campus last week— and after UVM police declined to look into the matter—the Cynic’s editors have decided to investigate the theft themselves. The editors are poring over reams of security tape looking for footage of the person or people who they suspect cleared out every newspaper in the student center and library, the two highest-traffic readership areas on campus. Bundles of a crime-centric issue were removed from stands. “We have staff reviewing the tapes, and are hoping to have a suspect identified by the end of the week,” Cynic Editor-in-Chief Brent Summers said Monday in an email. The issue that disappeared covered a number of campus crimes. 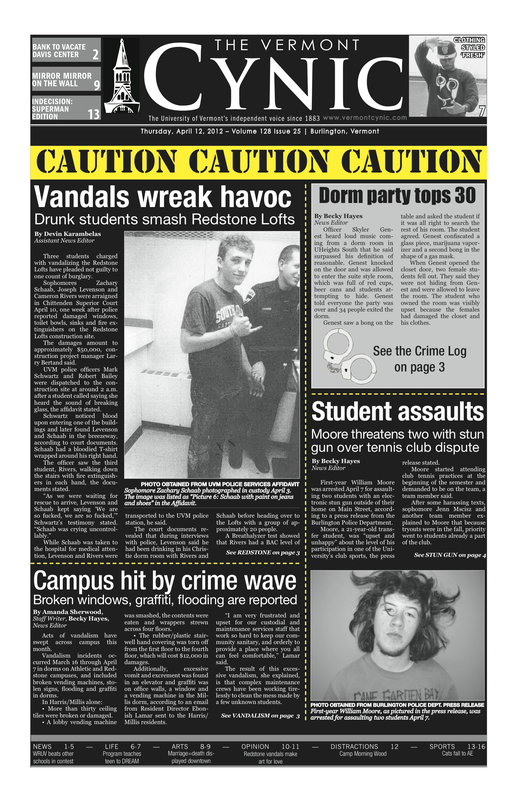 Editors said they suspect that whoever took the papers didn’t appreciate the coverage, which ranged from the reporting of three drunk students arrested for $50,000 in vandalism to a story about a would-be tennis player who used a stun-gun on his fellow students. UVM police last week declined to investigate, saying that because the paper is free to students, no theft occurred, Summers said. Cynic editors see the matter differently. The Student Press Law Center in Washington, D.C., says that such thefts should be investigated. Earlier this month, in a high-profile case, college employees at Christopher Newport University in Virginia were found to have removed copies of the student newspaper, which had reported on a local meth bust, to keep the story hidden from visiting, prospective students. The Cynic’s crime-centric issue likewise disappeared on a day set aside for giving tours to admitted students. However, in Tuesday’s Burlington Free Press, UVM officials said they could guarantee that no university officials were involved in taking large numbers of Cynics from the stands.